focuses on rebuilding population rather than just preventing extinction. But will it work? REDFISH LAKE CREEK, Idaho -- A vermilion slash in clear, cold water, the Snake River sockeye in this mountain stream is one of nature's long-distance athletes, traveling at least 900 miles to get here. That this fish can make such a journey -- the longest of any sockeye in the world -- is remarkable. But it's more incredible that this fish is still around at all. Down to just one known fish -- dubbed Lonesome Larry -- in 1992, state, tribal and federal fish managers have painstakingly preserved the species in captivity ever since. 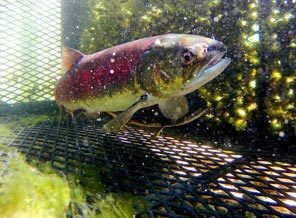 The sockeye rescue is part of a much larger Columbia River Basin Fish and Wildlife program -- believed to be the largest of its kind in the world -- that has cost Bonneville ratepayers more than $12 billion since 1978, depending on how you count it. While Elwha Dam removal cost U.S. taxpayers $325 million, BPA ratepayers spend more than $200 million each year -- including $311 million budgeted this year alone -- on programs intended to restore fish, wildlife and habitat harmed by the Columbia and Lower Snake River dams. It adds up: The program's cost accounts for one-third of the wholesale rate Bonneville charges utilities that use its power, including Seattle City Light, which buys 41 percent of its power from BPA.